Add in scheduled dam releases to ensure challenging rapids plus well-organized and welcoming hospitality and it’s easy to see why so many people flock to this region every spring and summer to get out on the water. Check this out: Go eagle-spotting! Rafting, kayaking or canoeing down the Delaware, designated a National Scenic and Recreational River, alert observers can spot a variety of wildlife, including otters, beavers, ospreys, red-tailed hawks and a rebounding population of bald eagles. Visit www.nps.gov/upde/. Paddle along an ancient highway. The Hudson River was a highway for Native Americans as well as early European explorers and settlers. Today, day cruises are a relaxing way to take in the quaint villages, palatial 19th century homes and majestic scenery of the Hudson Valley region. For those who prefer to navigate on their own, the Hudson River Greenway Water Trail has organized a 256 mile stretch of river. The Trail runs from the bucolic Champlain Canal and turbulent white waters of the upper Hudson River to Manhattan’s Battery Park and the Hudson River Estuary. Open to kayaks, canoes and all types of water craft, the trail has entry points roughly every ten miles with access to wildlife marshes, campsites and inns, historic river towns and sites and hiking trails. Visit www.hudsongreenway.ny.gov/, www.travelhudsonvalley.org/ or call 1-800-232-4782. Check this out: The Hudson Valley Outdoor Expo, June 2 and 3 in Poughkeepsie, will celebrate the region’s wild side with kayak, running, urban mountain biking, swimming and bouldering competitions and interactive exhibits by adventure providers. Catch the wind. Both expert sailors and newbies can hone their skills and earn American Sailing Association certification at Sail Long Island in Greenport. Perfectly situated to catch the great winds at the eastern end of Long Island, the sailing school is in the heart of some of the world’s best sailing destinations. Experience sailing on a two-hour cruises or charter, sign up for group or private lessons, or join one of the multi-day learning trips and visit historic whaling ports such as Mystic as well as sailing meccas like Block Island, Cuttyhunk and Newport, home to the America’s Cup races. Visit www.discoverlongisland.com/ or www.saillongisland.com/ or call 1-917-912-6342. Check this out: Set sail on a National Historic Landmark, the restored 60-foot Priscilla. The 19th century sloop departs from the 14-acre Long Island Maritime Museum in West Sayville, where historic buildings, ships, artifacts and exhibits paint a picture of the island’s past. Visit limaritime.org/ or call 1-631-HISTORY. Raft through “The Grand Canyon of the East.” At Letchworth State Park, (www.nysparks.com/parks/79/details.aspx) sheer 500-foot tall vertical rock walls frame the Genesee River as it carves its way through a dramatic gorge. The state park, located in the Finger Lakes region (www.fingerlakestravelny.com/), is a great place to raft this spectacular river and enjoy thrilling scenery spiced with occasional spurts of novice-friendly class I and II rapids. Additional whitewater rafting options beckon in the Adirondacks region (visitadirondacks.com/), where the Sacandaga River offers exciting Class III rapids thanks to scheduled water releases that extend the rafting season through the summer. 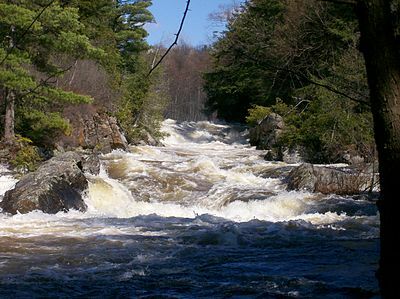 The Adirondacks also offer relaxing summer floats through Ausable Chasm as well as challenging class IV and V rapids such as the seven-mile run at Black River Gorge, and the Hudson River Gorge, ranked among the top ten runs in the U.S. Check this out: For the ultimate (Class V-plus) challenge, whitewater rafters head for the whirlpool rapids of the Niagara River in the Greater Niagara region. Visit www.greaterniagara.com/ or call 1-800-622-2686. Island hopping by boat. A top yachting destination, the 1,864 islands of Lake Ontario and the St. Lawrence River in the Thousand Islands-Seaway region invite sailors and power boaters to set their own pace to stop at whim at lovely secluded beaches along warm water inlet of Lake of the Isles and Sandy Island Beach (nysparks.com/parks/153/details.aspx). Those who don’t bring their own launches can rent pontoons, kayaks, fishing boats and runabouts and then navigate to charming waterside restaurants, campgrounds, and even golf courses and resorts, many accessible only by boat. Along the way, it’s easy to reel in dinner, from lake trout, king salmon and walleye in eastern Lake Ontario to muskie, northern pike, bass and Lancaster perch on the St. Lawrence River. Visit www.visit1000islands.com or call 1-800-847-5263. Check this out: Either independently or with an organized boat tour, visitors can stop to tour the Boldt and Singer castles, both built with fantastical underground tunnels and towers by turn-of-the-century power barons. Visit www.visit1000islands.com. Check this out: Guided nature and history walks, special exhibits, rowing regattas, musical performances and more will be on tap in many canal-side towns during the 7th annual Canal Splash! on August 10-12, 2012. www.canals.ny.gov/ or call 1-518-436-3034. Glide through the wild country. The sound of birds and rustling leaves is broken only by the gentle splash of paddles as canoes and kayaks glide through New York State’s wilderness areas. One of the most popular routes is the classic “Adirondack Seven Carries” in the St. Regis Wilderness Canoe Area of the Adirondacks. Here, a nine-mile loop traversing 10 lakes and ponds is connected by short portage trails. The route can be done in a day, but most people camp for a night or two along the way. For the more fit and adventurous, an extended “Nine Carries” route goes even farther into the wilderness. Local outfitters can provide “glamping” services, setting up camp, cooking and handling the porterage. Other scenic paddling and boating routes crisscross the state including the Saranac Chain of Lakes and the Fulton Chain of Lakes, near Old Forge. Visit visitadirondacks.com/. Check this out: Competitive kayakers can compete in the General Clinton Canoe Regatta (www.canoeregatta.org/), May 25-28, part of the North American Triple Crown of Canoeing; and the 53rd Hudson River Whitewater Derby (www.whitewaterderby.com/), May 5-6. Cruise into history: In the Chautauqua-Allegheny region (visitwesternny.com/) step back in time on the Chautauqua Belle, which offers sightseeing and dinner cruises on Lake Chautauqua, or the Minnie-Ha-Ha, which offers narrated cruises on Lake George? These are among the few remaining authentic steam-powered paddle wheelers still operating. It’s also fascinating to experience what it’s like to be raised and lowered 20 feet through a canal lock as you depart from Herkimer in Central New York (www.nyfun4u.com/cny.php), cruise the Erie Canal on the Lil’ Diamond II, or sail out of Lockport in the Greater Niagara Region (www.greaterniagara.com/) and experience the Erie Canal’s only double set of locks, which enable a 49-foot elevation change that connects the Hudson and Niagara rivers. Mid-Lakes Navigation in the Finger Lakes (www.fingerlakestravelny.com/) also offers Erie Canal cruises as well as champagne dinner sails that cruise past the stately homes of Skaneateles Lake, and a mail cruise which delivers mail, as it has for 75 years, to homes along the lake. Check this out: Architecture buffs and kids alike can enjoy the amphibious Albany Aqua Ducks tours, which offer streetside commentary about the city’s Gilded Age architecture and other historic sites before splashing into the Hudson River for a duck’s eye view. Visit capital-saratoga.com/ or www.albanyaquaducks.com/. Tarantulas, Gila Monsters, Mountain Lions and Western Diamond Back Rattlesnakes!